For the second time in three years the Fordham Rams will enter the season with a new head coach. Andrew Breiner left the Big Apple to join former Ram’s head coach Joe Moorhead at Mississippi State last December. Stepping in to replace Breiner is Joe Conlin. Conlin spent the previous 6 seasons as Yale’s offensive coordinator. Prior to his time in New Haven, Conlin had coaching stints at Harvard and New Hampshire. Needless to say, Conlin has been part of winning FCS football programs for over a decade. Conlin does take over a program that took a serious step back in 2017 after posting 5 straight winning seasons. The Ram’s entered last year with a preseason Top 25 ranking and arguably the best player in FCS, Chase Edmonds. As fate would have it, Edmonds was injured early in the season, the defense struggled and the campaign ended up being a failure relative to expectations. The good news for Conlin is the cupboard is far from bare, especially on offense. 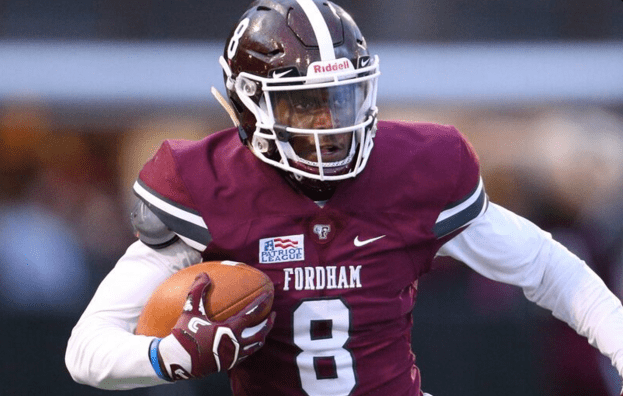 In order to get Fordham back to its winning ways priority number one must be getting vastly improved play from the defense. It started to show cracks at the end of Moorhead’s tenure and has been on a steady decline since. For the first time in 5 years the centerpiece of the Ram offense won’t be record setting running back Chase Edmonds. Taking over for Edmonds will likely be the tandem of junior D’Angelo Palladino (481 yards 4 TDs) and sophomore Zach Davis (391 yards 2 TDs). Freshman Naim Mayfield is worth keeping an eye on as the season goes along. Mayfield enters Fordham following an extremely decorated high school career in New Jersey. The quarterback position seems up in the air. Seniors Luke Medlock and Austin King (Indiana Transfer) both had chances to start last year due to a revolving door of injuries under center. Between the two, Medlock is more experienced but King is the better overall athlete. Given the weapons at the skill positions, both are more than capable of putting plenty of points on the scoreboard if they protect the ball. Whomever gets the starting quarterback spot will have a plethora of experienced, talented pass catchers to work with. Preseason 1st Team All-PL Austin Longi (36 rec 462 yards 3 TDs) and Corey Caddle (33 rec 392 4 TDs) will lead the way at wide receiver. Both battled through injuries last year. Fellow seniors Andrew Prince and Jonathan Lumley give the Rams two big targets out wide in the red zone. Senior Isaiah Searight (33 rec 452 4 TDs, Preseason 1st Team All-PL) gives the Rams an extremely dangerous weapon at TE. On paper there should be a decent amount of concern entering the season regarding the offensive line since Fordham lost 3 starters to graduation. The biggest loss of all is LT Anthony Coyle. Coyle was one of, if not the best Fordham linemen in the Patriot League era. Sophomore Nick Zakelj will likely move from RT to LT while junior Dominic Lombard (Preseason 1st Team All-PL) is a rock at center. After Zakelj and Lombard things get interesting. Sophomore Will Conley, freshman Austin Glazier and sophomore Matt Donovan should battle it out for the other tackle position. The guard positions seem a bit more up in the air. Juniors Marcel Deya and Anthony Solano along with sophomore Jake Troutman and freshman Phil Saleh are names in the mix for the two starting spots. The Ram’s Patriot League Championship aspirations begin and end with the defense (34.9 ppg allowed, 6th in PL). Like fellow league contender Lehigh, Fordham MUST get better on “D” (431.5 ypg allowed, 103rd in FCS) if they’re going to seriously challenge for a league title and postseason consideration. If there’s one particular aspect that needs improvement it’s the run defense (209.5 ypg allowed, 108th in FCS). In an era that favors passing before the game even begins, stopping the run is paramount. If Fordham is going to improve along the defensive line it will be up to a very young group to get the job done. There’s not a single senior defensive lineman on the Ram’s roster. Outside of junior DT Michael Ware (started all 11 games) Fordham will rely on a number of sophomores and freshman to contribute during the course of the season. Deondre Carter seems a safe bet at one DE spot while Mike Marinelli will see significant time at DT. After those two it should be wide open race for playing time. Keep any eye on Anthony Diodato. The sophomore was one of the best high school lineman (1st team All-State 5A OL and DL) in Pennsylvania. The linebacker unit returns a good amount of game experience. Glenn Cunningham led the team in tackles as a freshman despite missing two games. The Nutmeg State native will vie for postseason league honors. Senior Lawrence Menyah will likely join Cunningham as a starter. James Biggs-Frazier will be in the running for the flex starting spot as well. Jeremy Imperati gives the defense a solid rush end. There’s not a lot of size at the linebacker which remains a concern given the Ram’s struggles against the run. The secondary is anchored by Preseason 1st Team All-PL CB Dylan Mabin (Senior). Junior Jesse Bramble will almost certainly join at Mabin at CB. Safety Antonio Jackson (’17 2nd Team All-PL) is an excellent safety. The other safety position seems wide open. There’s plenty of experience returning in the special teams department. Andrew Mevis handled all the kicking duties as a freshman and should do so again this year. Austin Longi and Dylan Mabin have plenty of reps handling returns. If new head coach Joe Conlin can settle on a quarterback and get improved play from the front 7 on defense the Rams have as good a shot as anyone to win the Patriot League. The talent and experience at the skill positions can rival anyone in the league. The offensive line will go from a weakness to a strength this year despite the loss of Coyle. Conlin’s troops will face a formidable, but not overwhelming out of conference slate. The Rams open up with a winnable FBS game against a downtrodden Charlotte team then head to Virginia to face the rebuilding Richmond Spiders. The toughest test of the season will likely come on September 15th when Fordham hosts a loaded Stony Brook squad. 2017 NEC Champion Central Connecticut State and fellow NEC’er Bryant round out the non-league portion of the schedule. Heading into the season everyone is talking about the Colgate-Lehigh clash set for the league’s penultimate weekend. However, it’s the Raider’s trip to the Bronx the week before that may very well decide the league race. If the Rams can split with Lehigh and Colgate while avoiding a potential pitfall against Holy Cross on November 10th there’s a great chance they end their two year postseason hiatus.